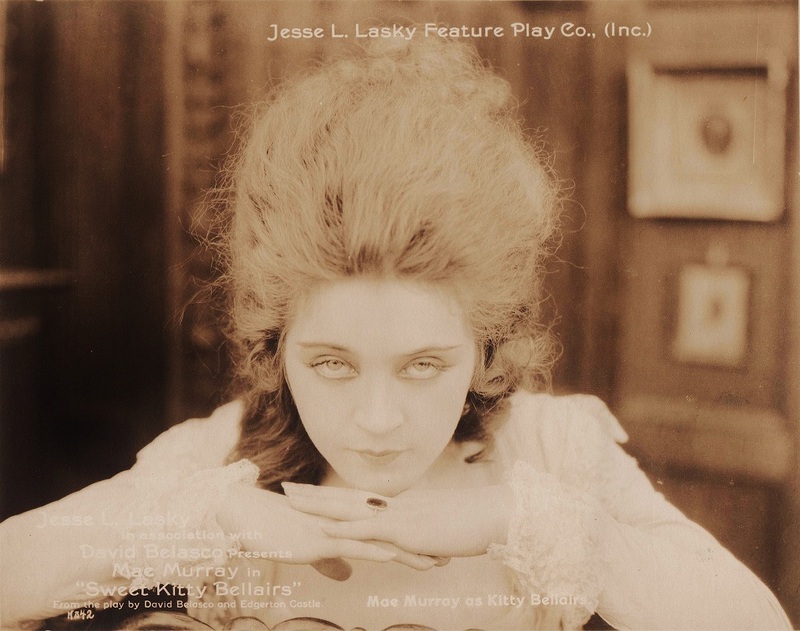 Her second film, her first success — Mae Murray as Sweet Kitty Bellairs (Famous Players-Lasky, 1916, James Young, director). If there is a common denominator in the early lives of figures of the performing arts and world of entertainment in the late 19th and early 20th centuries — people who formed the foundation of what we still consume for entertainment and appreciate as art in the second decade of the 21st century — it is a chaotic childhood in a family that was less than stable, and in many cases much less. It is not my intent to delve into the psychology of the artists and their arts, the entertainers and our entertainment, but basic elements that recur in the narratives of those who created that art and entertainment are too obvious to ignore. It also begs a much larger question about the nature of what many now call family values and the supposed recent breakdown and decay of society that contributes to fractured family units. Ongoing, and seemingly unstoppable moral decay, substance abuse, violence, debasement of educational systems makes one feel we are nearing some sort of societal Armageddon that will bring us to a new dark age. Studying the past, however, makes me lean toward believing that family stability, while always a most desirable state, was not nearly as common as we believed it to have been. I risk being accused of cherry-picking my examples, but looking at the early lives of several major figures — those who are indisputably the foundations of major art forms of our culture — the similarity of their bleakness is astounding. One has only to read the autobiographies of Mary Pickford, Charlie Chaplin and Lillian Gish (all of which were best sellers in their original publications in 1954, 1964 and 1969, respectively — and Chaplin’s has never been out of print) to find common elements in their childhood of extreme poverty, domestic violence, insanity, and death from alcoholism. Her biographers, both Jane Ardmore in The Self-Enchanted (1959) and Mr. Ankerich in his recent book, give us (or me, at least) the impression that she was happiest during the period in which she first rose to prominence in the cabarets and the musical stage of New York. Due to a combination of Murray’s lifelong secretiveness and the nature of her work during this period, roughly 1906-1915, this was the least documented time of her career. Not a huge surprise; the documentation of vaudeville and cabaret acts — even the Ziegfeld Follies and similar forms of early 20th century entertainment — is thin and elusive. And in the first year of her work in film, Murray was a reluctant movie star, and critics were equally unsure of her. Mae Murray can be seen as an early attempt by Adolph Zukor, one of the first and most important of the early movie moguls, to create a new star out of someone who was neither a star of stage, nor a film actor. Before he signed Murray, Zukor had made two important acquisitions — actresses who were already noted stars of film — Blanche Sweet and Mary Pickford. Pickford by 1913 was the best-known actor in American film, with a significant if modest stage pedigree. 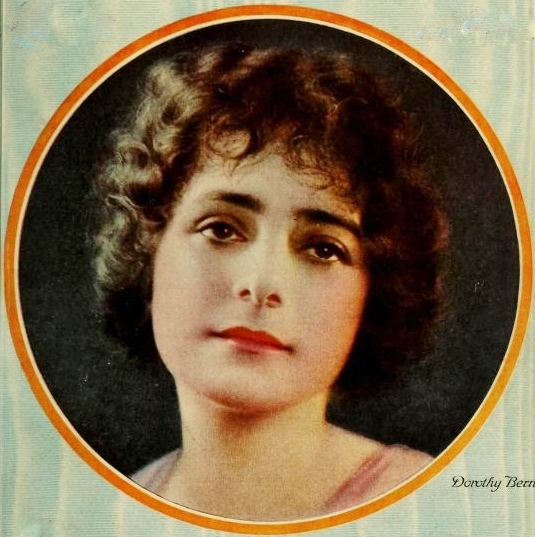 Sweet had appeared on stage from early childhood, and was D. W. Griffith’s top star when she left him after he gave the leading role of Elsie Stoneman in Birth of a Nation to Lillian Gish. But as she began her film career, Mae Murray was a star only in Famous Players’ movie advertising campaigns. 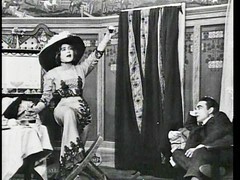 Mae Murray’s earliest triumph, the gig that got her the attention of film producers including Zukor, was Ziegfeld’s Follies of 1915 in which she performed a double satire of Mary Pickford by playing a character, “Merry Pickum,” in a short film played for the Follies audience during which a live Murray in the same character ran into the audience chased by a “masher.” While some papers thought Murray was the highlight of the show, one, the highly influential trade paper The New York Dramatic Mirror, failed to even mention Murray’s performance in their review of the Follies. Mary Pickford was said to have been less than pleased with the “imitation.” She may have had even more reason to be displeased with Zukor when he signed Mae Murray to a movie contract. 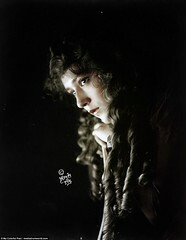 In addition to Murray, Zukor had already signed Marguerite Clark, a petite four-foot ten child-woman who was promptly given parts Pickford had wanted to play, particularly the dual roles of The Prince and the Pauper. I’ve never seen it reported or suggested, but I’d venture that Zukor, much like Griffith on the eve of the 1910 Biograph trip west, had begun to play his females one against the other not only to goad them into greater competition, but to blunt or forestall requests for increases in salary. 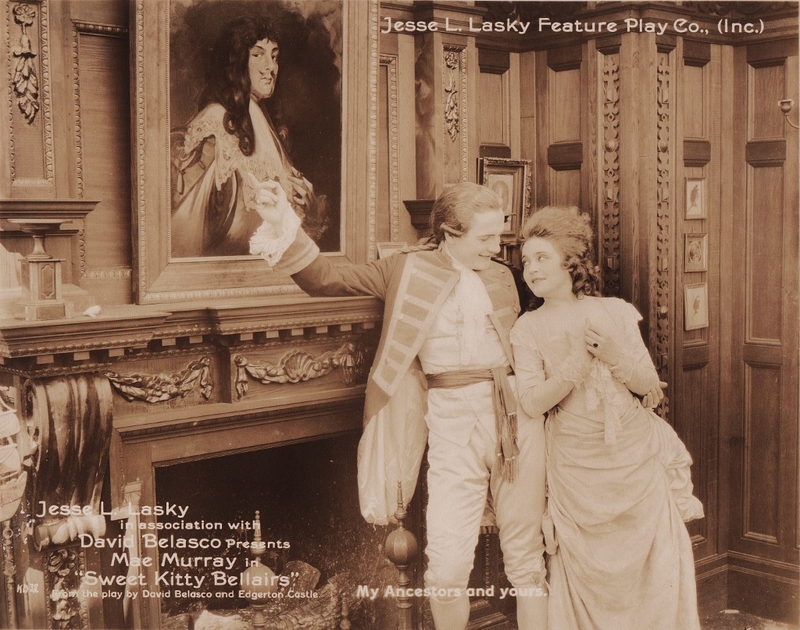 Jesse Lasky, most recently a producer of vaudeville, was now Zukor’s partner and had his own production unit within Famous Players. Zukor and Lasky together had acquired a controlling interest in Paramount Pictures, a film distribution company that now served as an umbrella corporation for their production companies. Paramount Pictures would rapidly acquire other, smaller producers and develop the practice of “block booking,” a system of film distribution that worked to guarantee a consistent level of profits to the producers and distributors by forcing exhibitors to rent a fixed group of titles supported by a handful of important films by big stars such as Pickford; it was a system that would eventually be ruled illegal by the courts. 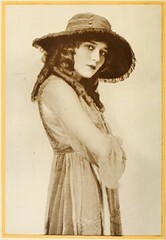 Pickford would rebel against it by negotiating a separate distribution agreement exclusively for her films under the Artcraft name. But Mae Murray was several years away from being able to wield that kind of power. 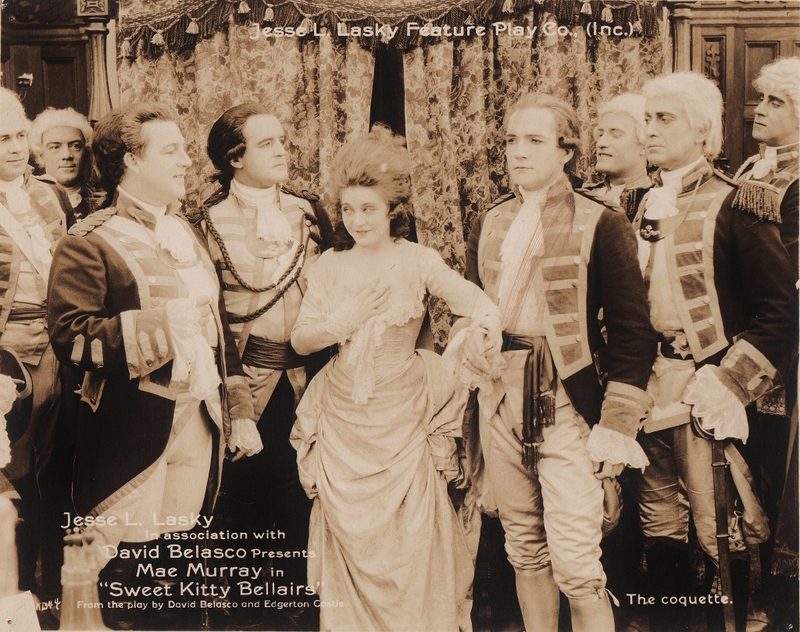 Zukor’s pitch to Murray continued: not only would she be a stage star turned movie queen, he would give her the starring role in Famous Players’ movie adaptation of Belasco’s earlier stage hit, Sweet Kitty Bellairs, in which she would play a 17th century English noblewoman in love with an officer and gentleman. And that decided it for her. But her first role upon arrival in California in January, 1916 would not be “Sweet Kitty” as she had anticipated. She had to accept for the time being what Zukor and Lasky threw at her. Murray was assigned to Lasky’s production unit. Her first film would be To Have and to Hold, an adaptation of a novel about the early settlers at colonial Jamestown. The making of it was for Murray nothing less than a disaster. A glowing “review” of To Have and To Hold by the Philadelphia North American is trumpeted in this ad by Paramount Pictures in The Moving Picture World, Apr 1, 1916. As a dancer who whose interests went beyond the latest ballroom steps and toward modern interpretative dance, Mae Murray was stunned by the restrictions imposed by a mostly immobile camera in a small, interior set. Worse, she found herself harangued by the director. Though with limited stage acting experience, Murray surely was familiar with a stage director bellowing his instructions across a cavernous proscenium. But a film director standing ten or fifteen feet away yelling orders through a megaphone was rattling to the very bones of the novice film actress. 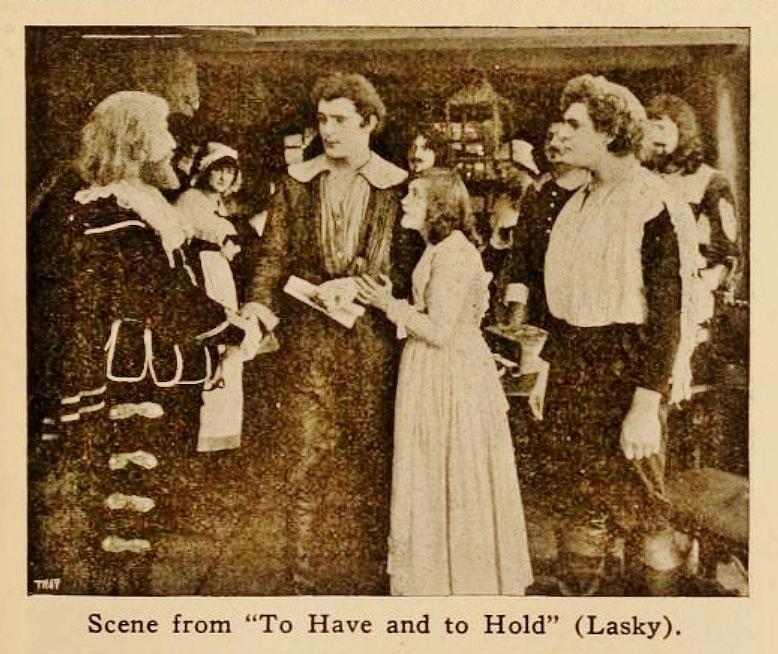 Though co-star Wallace Reid and his wife, actress Dorothy Davenport, offered professional and emotional support to Murray, the results on screen prompted some critics to be less than charitable. “Mae Murray in the leading role was pleasing in a negative manner. She has not seized the possibilities of the leading character of the book, and because of this her work is far from convincing. The motif of the screen is expression, and no actress can ever hope for success in this field who has only one facial expression and uses it upon every occasion.” The New York Dramatic Mirror, March 25, 1916. It would certainly help us understand the criticism if the film was available for viewing. Unfortunately, none of the six films Mae Murray made in her first year in the movies are known to exist. The Moving Picture World review gives us the impression that we might be disappointed by the film, though its historical value as Mae Murray’s film debut would be considerable (as would the “Merry Pickum” short from the Follies of 1915 if by some miracle even a fragment was found). 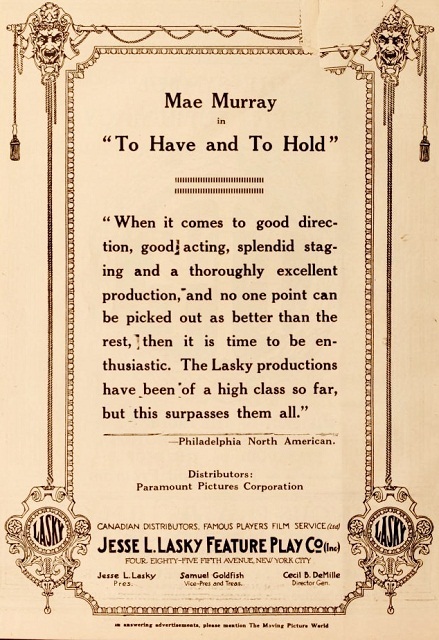 “This filmed version of a popular novel scarcely comes up to the general high standard of Lasky features; it does not abound in dramatic material such as we usually see worked out in Lasky plays. . . . Mae Murray makes her first appearance on the screen. A first effort is always entitled to indulgence and in this case something like a plenary [i.e. complete and unconditional] indulgence is needed.” W. Stephen Bush, The Moving Picture World, March 18, 1916. “Again we see an ingenue in a leading part, who does not fill the bill at all. Mae Murray is dainty enough for “goody-goody” parts, but lacks experience sufficient to bring out the strong character of Lady Jocelyn Leigh . . . Wallace Reid had the best part in the play and stood out prominently, but why select an undersized young girl to play opposite? The Lasky Company is surely not “shy” on women who look the part, for I have seen many such in its pictures.” The Moving Picture World, April 8, 1916. After the personal and professional bruises of her first film experience in To Have and to Hold, it appears that Murray was on the verge of walking out on her contract. What kept her from ultimately doing so (aside from the strong possibility of legal action against her) was the offer of a more amenable, actor-friendly director — the actor-writer-director James Young, husband of star Clara Kimball Young — on the film that Zukor had originally promised her, Sweet Kitty Bellairs. Though another period piece, this was at least something she could play with more comfort, an eighteenth century costume drama — it even had dancing, if only the eighteenth century kind. It also had the David Belasco pedigree, something no film producer adapting one of his plays would fail to exploit. “This feature comes up to the expectations which the public nowadays entertain when a Lasky production is on the program. May [sic] Murray, the star of the play, finds the part of a very beautiful and lively girl much more to her taste than the role she essayed at her first attempt in the drama of the screen. 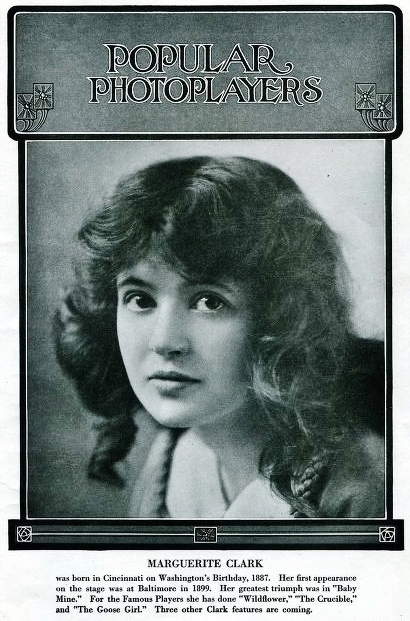 Miss Murray made a dainty lovable Kitty Bellairs; she was, as the French put it, ‘tres femme.’ Her girlish graces, her innocent witchery, her sweet roguishness are bound to captivate every audience.” The Moving Picture World, June 3, 1916. “‘Sweet Kitty Bellairs’ brings to the screen a feature that touches the high-water mark of polished film drama. . . The character of ‘Sweet Kitty,’ winsome, mischievous, an incorrigible flirt, yet loyal withal to friends and lover, is more suited to her fetching personality. Her love-making . . . is the essence of witchery, and the lightning-like change to a pretty transport of rage . . . is but one instance of many during the performance that marks her versatility. The flashing sallies of wit . . . are necessarily lacking in the film [version], but this is largely made up by the excellent pantomime offered in the acting of the leading lady.” The New York Dramatic Mirror, May 27, 1916. Mae Murray’s next film would be a fantasy of the slums and knights of old, a compelling combination from the pen of Jeanie MacPherson, one of a group of important and prolific female screenwriters of early film that also included Francis Marion and Anita Loos. Like Loos, MacPherson practiced her craft in the incubator called Biograph, writing and acting for D. W. Griffith. She left Biograph and entered into a professional and personal relationship with Cecil B. DeMille, another actor/writer soon to become feature film director, and went with him to Southern California to establish one of the early film colonies, clustered around a repurposed barn. By 1916, DeMille already had major successes with The Squaw Man (1913) and The Cheat (1915), and held the imposing title of “Director General” for Famous Players. DeMille had acquired a reputation as a tough taskmaster — Zukor would assign him to direct Mary Pickford after her first project with her semi-autonomous production and distribution companies stumbled with their initial effort, Less Than The Dust. But with a potentially combustible combination in Murray and DeMille, surprisingly there were no sparks, at least none that either mentioned over the next forty-five years. Maybe it foreshadowed the success that another equally strong director, Erich von Stroheim, would have in drawing an especially effective performance from dancer Murray. The film in which DeMille directed Murray was The Dream Girl. 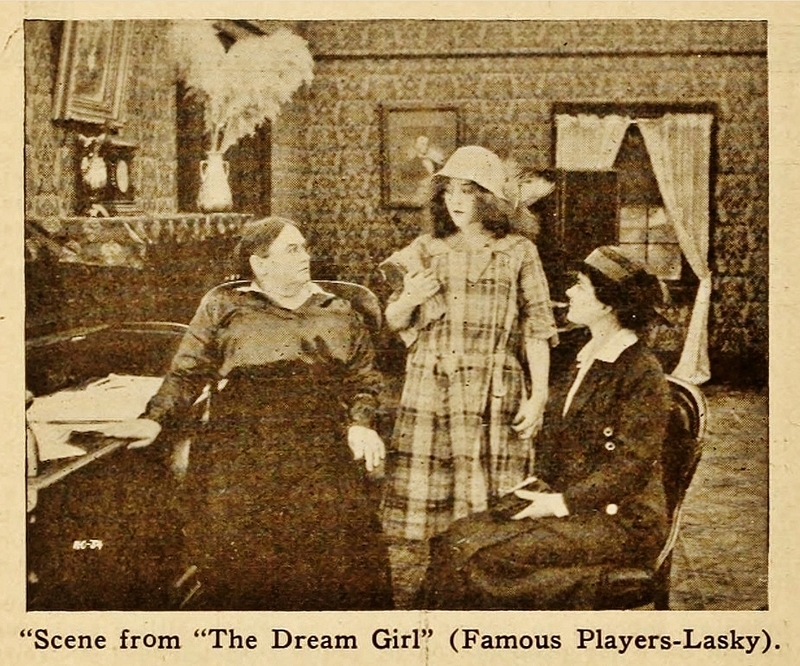 Jeanie MacPherson had written The Dream Girl as the fantasy of a slum girl in which she is rescued from her plight by a knight in shining armor, a fantasy that culminates in a real-life equivalent for the heroine of the story. As Michael Ankerich points out in his biography of Murray, the role resonated with her — it was one she would return to more than a few times over the next decade. To the critics, it was also apparent that the combination of Follies star and girl of the slums, both very real for Mae Murray, made for exceptionally good fictional film drama. Lynde Denig of The Moving Picture World was effusive in praise of Mae Murray’s performance, which seemed to persuade those, including the reviewer, who may have harbored doubts about her ability as a film actor. “If there were any doubts about the wisdom of starring Mae Murray after her performances in ‘To Have and to Hold’ and ‘Sweet Kitty Bellairs,’ they are set at rest by her playing of a slum girl in this photoplay, from the pen of Jeanie MacPherson and produced by Cecil B. DeMille. That Miss Murray possess a piquant charm is amply evidenced in her portrayal of the ill-used Meg, a pitiable waif . . . In rags, or in costly gowns, the new Lasky star is a magnetic little creature, always spontaneously girlish.” The Moving Picture World, July 29, 1916. “A combination of sparkling comedy, adventurous thrills, dream romance and pretty sentiment is offered by this latest Lasky film with saucy little Mae Murray as star. 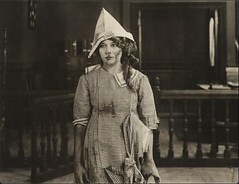 The role is especially well suited to Miss Murray, whose humorous gifts are every whit as well developed as her sense of tragedy, and in her presentation of ‘Meg,’ the child of the slums, she registers what many critics will decide to be her most effective work on the screen up to date. “With the exception of Miss Murray’s rather careless makeup in the latter stage of the picture, which spoils her piquant features by exhibiting a pair of most extraordinary eyebrows that the closeups accentuate with unpitying zeal, the film calls for nothing but favorable criticism. ‘Meg’ is a delightful creation, certain to appeal to popular sympathy, and Mae Murray’s never-failing dash, energy and clever comedy touches combine to make the dream child of the tenements a lasting and pleasant memory.” The New York Dramatic Mirror, July 25, 1916. Not letting a good formula go after one success, Murray’s next project for Famous Players would cast her again as a slum girl, but this time it would take her back home to New York. 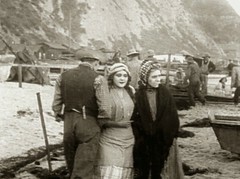 For this film, she was technically “transferred” to Adolph Zukor’s Famous Players production unit and New York studio ostensibly to shoot on actual city locations rather than build sets in California. The Big Sister no longer exists, so it is impossible to know for certain how much of it was shot near her old neighborhoods in Manhattan. As Anna Mary Koenig she had resided in the Lower East Side on Broome Street, and in the German enclave of Yorkville on East 89th Street, before separating from her mother and entering show business in her teens. “A wistful appealing look is all that Mae Murray attempts to give. Only once or twice during the entire picture does she assume a semblance of a smile. A little more animation and expression would not have detracted from her part, even though it is limited. . . The remainder of the cast gives most satisfactory portrayals.” The New York Dramatic Mirror, September 9, 1916. “It is a likeable picture, full of pretty scenes and is pleasant, for there is nothing in it to harrow one. 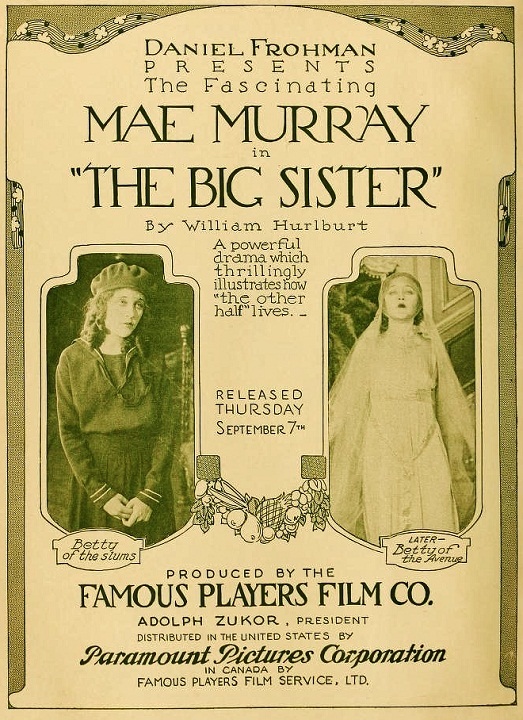 Mae Murray is charming as the diminutively big sister . . . The producer is J. B. O’Brien who has had better material to work with than this and who has done much better work, though in this picture his work is excellent.” The Moving Picture World, Reviewed by Hanford C. Judson, September 16, 1916. Shooting The Big Sister in New York gave Murray the chance to reconnect with her roots in the city, if only for a few weeks. But more importantly, it gave her the chance for some face time with the big boss, Mr. Zukor. Murray took the opportunity to express her unhappiness with movies and with her salary (according to Mr. Ankerich, it was $900 a week at this point). It seems she believed that a raise and assignment to more sympathetic directors might solve the problem (no one could characterize DeMille as “sympathetic” to actors, but Murray never specified any problems working with him on The Dream Girl). 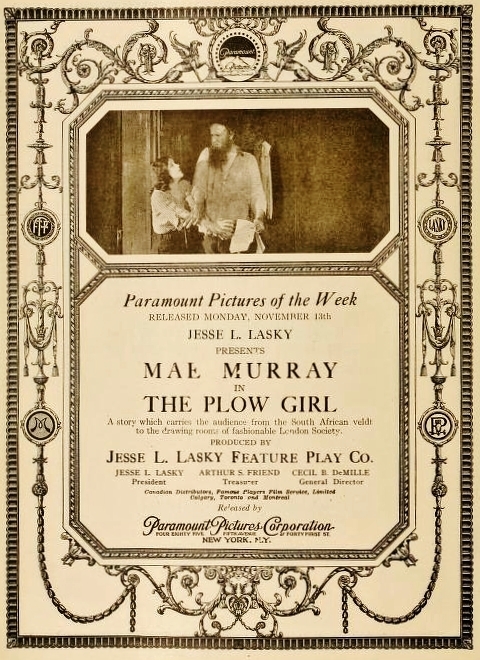 Zukor assigned a new acquisition to direct Mae Murray’s next picture, The Plow Girl. His name was Robert Z. Leonard. Leonard not only directed her next picture for Zukor, but would also direct most of Mae Murray’s films over the peak years of her career. He was undoubtedly the one element of stability that she would have in her career, or in life. He understood and had empathy with Mae Murray the creative artist for he, too, was one. He also must have been a man of near-infinite patience. They would marry within two years, in August 1918, once she obtained a divorce from her improbable second husband, a New York night club fixture named Jay O’Brien (no relation to the director of The Big Sister). Like Mae Murray, Robert Z. Leonard began his career on stage, in vaudeville. 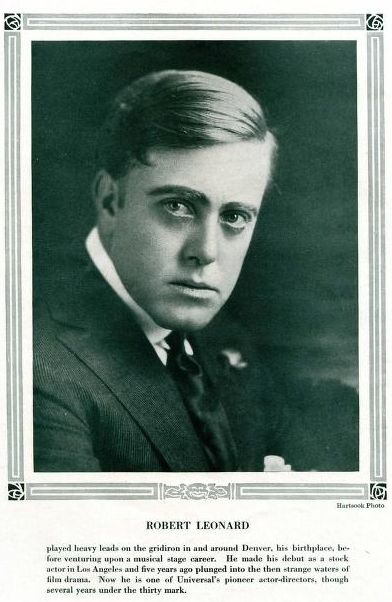 He entered film as an actor with the pioneering Selig Polyscope Company in 1907, and was with Selig when it became the first company to establish a permanent studio and headquarters in Southern California in 1909. By the time he met Murray in 1916, he had been working in film nearly a decade as an actor, writer and director. He appeared as the Scarecrow in Selig’s early one-reel version of The Wonderful Wizard of Oz in 1910, with Bebe Daniels as Dorothy. Though he did not participate in the MGM version, he directed numerous other musicals — including seven with Jeanette MacDonald — among the nearly seventy films he made for MGM from the mid-1920s to the late 1950s. How can one speak of a “woman’s director” without including Leonard? In addition to MacDonald, at MGM he directed Claire Windsor, Ann Harding, Barbara Stanwyck, Ginger Rogers and Greta Garbo; two films each with Corinne Griffith, Myrna Loy, Joan Crawford, Constance Bennett, Greer Garson and Judy Garland; three films with Lana Turner, six with Marion Davies and seven with Norma Shearer. And beginning with her next film, The Plow Girl, he would direct Mae Murray in two dozen features over the next seven years. 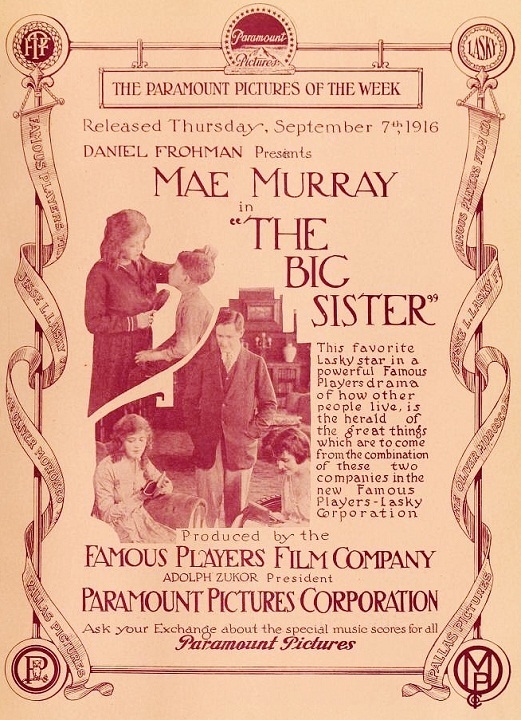 In October 1916, The Moving Picture World carried a notice from Famous Players announcing the return of Mae Murray to the west coast to begin work on her next feature film as “The Heir Apparent,” directed by Robert Z. Leonard, “dealing with the life of a young English girl in South Africa.” It was the story of a girl, orphaned with the death of her parents, who becomes a servant or virtual slave to a wealthy but brutal farmer. She discovers she is actually an heir to a wealthy English estate when a young English lawyer tracks her down in South Africa. The film was released on November 13, renamed, The Plow Girl, to generally favorable reviews. Julian Johnson of Photoplay found the plot weak, but the star presence of Murray thrilling (even if one of his theater companions, presumably female, did not), and the direction of Leonard exceptional. “‘Mae Murray would thrill you in five reels of the Constitution of the United States!’ disgustedly declared one of my [theater] accompanists after ‘The Plow Girl.’ And at that, I think she could — provided they had much Murray and not much Constitution. . . . 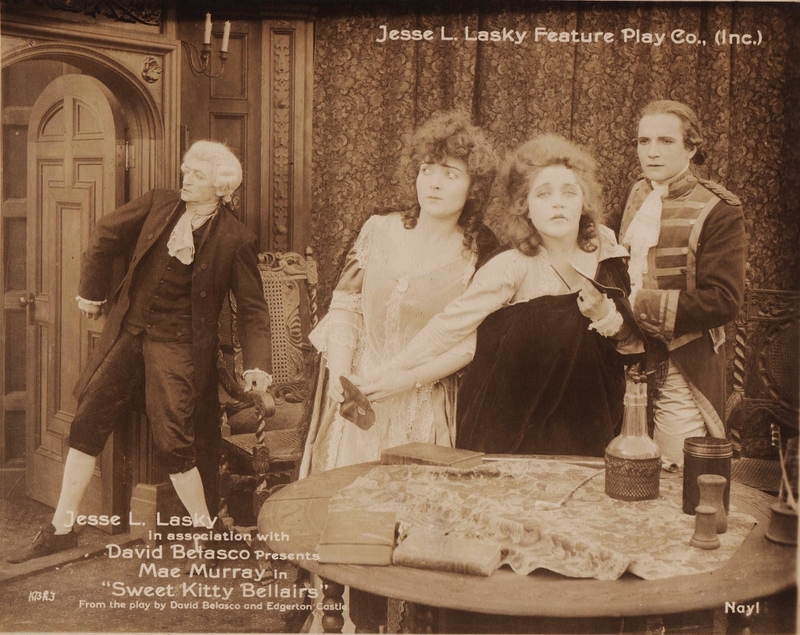 This play is Director Robert Leonard’s first with Lasky, and he handles it superbly. . . . And there is Mae, naive, sensuous, beautiful child — !” Photoplay Magazine, “The Shadow Stage” by Julian Johnson, February 1917. “‘The Plow Girl,’ a drama in which Mae Murray is featured . . has strong situations, the sort that are described as ‘actor-proof.’ The picture goes over in spite of the fact that the young woman whose names [sic] stands at the top of the list fails to impress the spectator. It goes over and goes over well because of the plot and also of the excellent supporting cast. ” . . . there are moments, especially near the close of the play, that markedly move. Fine ending, indeed, does ‘The Plow Girl’ have. . . Robert Leonard is the director, and he has done his work well. . . ‘The Plow Girl’ is a good picture.” The Moving Picture World, review by George Blaisdell, December 2, 1916. “While Mae Murray is the appealing heroine and Elliott Dexter the manly young hero, they are not by all means the whole show in ‘The Plow Girl.’ It is a well-conceived story and has been artistically worked out by the director. . . . The romance is well played by Miss Murray and Elliott Dexter. She combines a certain roguishness with pathos that makes an effective sort of coquetry.” The New York Dramatic Mirror, November 25, 1916. “Mae Murray’s Acting Makes Strong Appeal to the Heart as the Piteous Heroine of a Melodrama With a Telling Situation. ” . . . a film with emotional effectiveness above the ordinary. Mae Murray gets the situation over the spectator’s feelings with a sincerity and an intelligence pleasing to witness. . . makes you forget the time . . due to your anxiety for the piteous heroine’s fate with due thanks to the leading woman’s playing. The direction is able, but has one or two blemishes — the costume decidedly out of character worn by the heroine at the dance given by her mother is one . . .” The Moving Picture World, “Reviewed by Hanford C. Judson,” March 10, 1917. One wonders if Mae Murray was making her first attempt at a dance scene with the Follies-like transparent costumes that she and her director-husband Leonard would make a standard feature of her late 1910s, early 20s productions. This would be just the first of many occasions on which critics objected to these displays of the dancer’s art (though others thought them just fine). The reviewer for The New York Dramatic Mirror, probably quite used to displays of female figures in transparent costumes on the musical stage, focused on the plot and performances. “‘On Record’ is the story of a romance over which hangs the shadow of the night court. It has the ever popular theme of the innocent young thing who is accidentally caught in the machinery of the law and who is extricated after much misunderstanding and many tears . . . the piece is frankly melodramatic and, as such, is very dramatically done. “Mae Murray as the persecuted little stenographer is very alluring but struggles in vain to look unsophisticated in her role of the simple country girl. . . The main idea for advertising purposes lies in the fact that a girl can be placed ‘on record’ in the night court annals through no fault of her own. The spectacle of Mae Murray in such a role may be relied upon as an additional drawing card by exhibitors.” The New York Dramatic Mirror, by “A. G. S.,” March 3, 1917. As an actor, Mae Murray had tremendous competition at Paramount. The distribution firm having been absorbed by Zukor and Lasky was now acquiring more production companies, and taking in their directors, technicians and stars under the Paramount name. Legitimate stars of the stage such as Marie Doro and Lenore Ulrich, in addition to Famous Players incumbents Marguerite Clark, Blanche Sweet and of course Mary Pickford, made for fierce competition and all of them were considered stronger actors than Mae Murray. Which makes it all the more strange that her next film would be one so controversial that Paramount would decide not to distribute it, and Famous Players-Lasky would hand it off to an independent group of investors to sell it to states rights buyers, i.e., exhibitors who would buy the exclusive rights to show the film within a specific geographic region. But it would prove to be a breakthrough film for the actor, rather than the dancer, Mae Murray. John Douglas Eames, The MGM Story (Crown, 1979, revised second edition). Michael Ankerich, Mae Murray: the Girl with the Bee-Stung Lips (University Press of Kentucky, 2012); The New York Dramatic Mirror Archive at http://www.fultonhistory.com/; The Moving Picture World and Photoplay Magazine from the Media History Digital Library, at http://mediahistoryproject.org/. 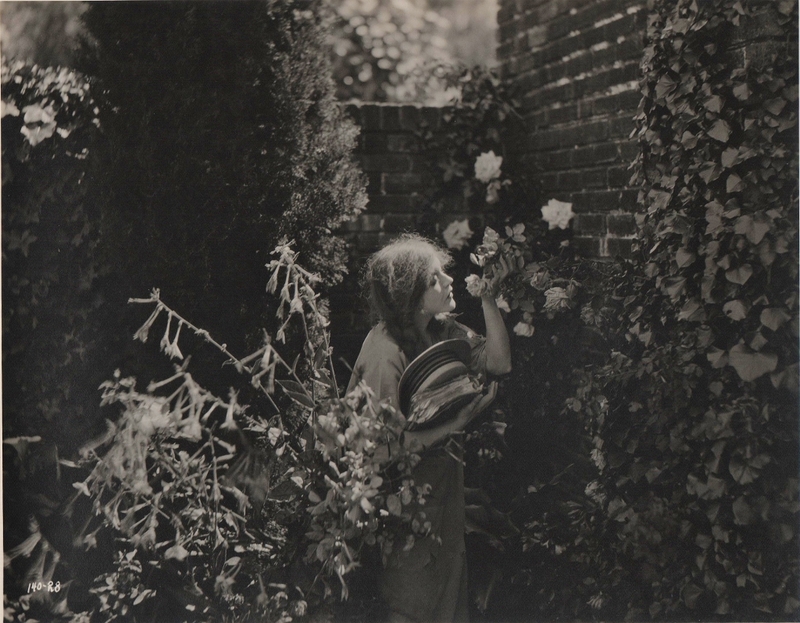 Mae Murray original lobby cards from Sweet Kitty Bellairs; and the “tenement garden” photo of Mae Murray in The Dream Girl, from the author’s collection.